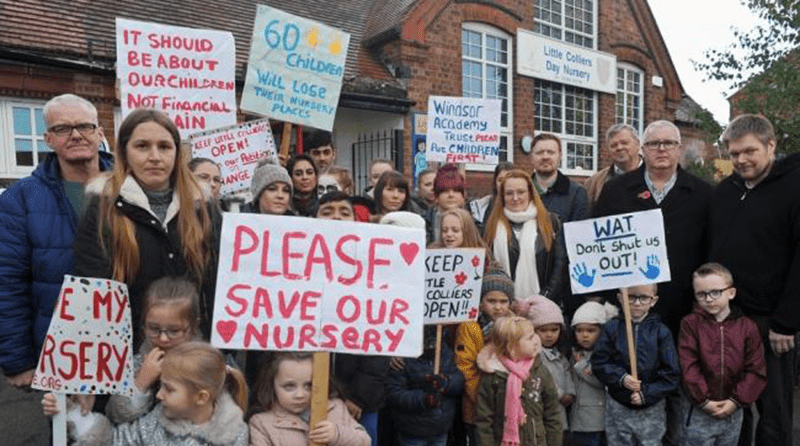 Reports last month said that Little Colliers Nursery in Halesowen could be closing its doors due to a cash shortfall, with the decision being made by Windsor Academy Trust, which also runs Colley Lane Primary School. The parents of children attending the nursery campaigned against the decision and got backing from MP, Margot James, and local councillors. The decision about the nursery’s fate was going to be made by the end of November, but it will now remain open for the short-term. A decision regarding the closure will still have to be made in the future. Ms. James, who started the campaign said the news overjoyed her. As reported in Halesowen News, she said: “I am thrilled that the nursery will remain open at least until the end of the academic year. It gives the board a chance to look at ways in which it can remain open permanently. “Early years education is a fundamental part of a child’s development. “When I was approached by anxious parents regarding the threat of its closure, I shared their concerns and made it a priority to work on their behalf for a solution. Another parent, Aziz Shah, is also reported to be delighted with the decision but knows that there is still more that needs to be done to keep the nursery open. “It’s half the battle won but obviously we want it to remain open beyond next year for the younger children. Windsor Academy Trust CEO, Keith Sorrell, released a statement saying: “I can confirm that, following a request from the school to delay any closure until the end of the academic year, and reading through the excellent responses from the consultation, Little Colliers will remain open until the end of the academic year. “The board discussion at the end of the month will discuss the long-term future of Little Colliers and will enable a more detailed consideration of all the factors involved.